GlassWorks has been widely recognized as the leading glass company and installation experts of architectural glass throughout the Greater Chicago Metropolitan Area for more than 37 years and counting. In addition, we are pleased to take enormous pride in our exceptional glass shower enclosures. It is no wonder that GlassWorks is recognized as the definitive destination for customers who are seeking the finest shower enclosures and glass shower stalls. Regardless of the kind of glass shower enclosure you desire, GlassWorks has the ability and know-how to take care of all of your glass shower enclosure needs! Since 1997, we have been delivering our outstanding, award-winning services to Deerfield residents with our broad selection of glass shower enclosures and glass shower stalls. In fact, we are identified as serving an average of 4,000 customers each year! As an affluent community, Deerfield, Illinois has more than 18,000 residents and is found in both Cook and Lake Counties. Glenview, the home to GlassWorks, is conveniently located only eight miles southeast of Deerfield. Whenever Deerfield residents are in the market for glass shower enclosures or glass shower stalls, they seek the advice of the pros at GlassWorks. Our sleek and sophisticated shower enclosures will produce a level of elegance and excitement to Deerfield baths. Consequently, Deerfield residents are well aware that GlassWorks is able to customize their glass shower stalls and shower enclosures to their exact specifications. Also, not only will our glass shower enclosures and glass shower stalls lend a look of sophistication to bathrooms, but our shower glass is often referred to as “safety glass” that ensure that bathers are protected within the reinforced shower glass structure. Furthermore, customers are always happy to learn that GlassWorks provides them with the most competitive and affordable prices. 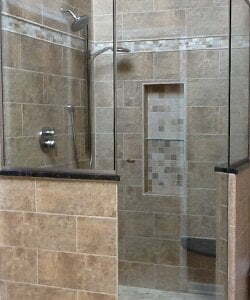 No matter what kind of glass shower stalls and shower enclosures you want, from frameless glass shower doors to neo-angle glass shower doors, glass steam shower enclosures, framed glass shower doors and custom glass shower doors, you can count on GlassWorks to handle your requests quickly and efficiently. Moreover, our GlassWorks’ installation technicians always treat customers’ homes like they do their own! For an appointment, complete our online form for a 10% reduction, or call GlassWorks at: (847) 729-5580 to receive a FREE ESTIMATE!